Got some important data stored on your iPad, such as, photos, movies, music, apps, and want to backup your iPad? 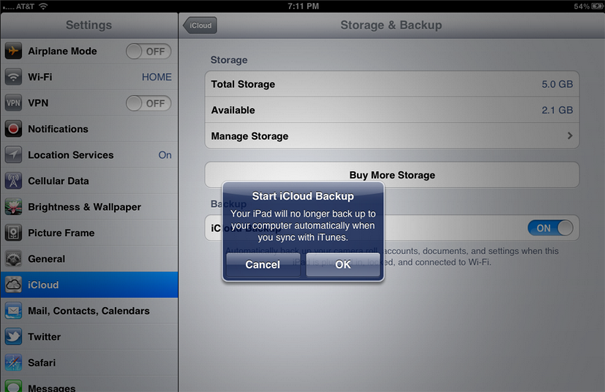 This post provides you three ways to back up iPad. Read on to find the solutions now. Free download AnyTrans and install it on your computer to backup your iPad iPhone and iPod after reading this post on how to backup an iPad. No matter you own an iPhone, an iPad, or an iPod, it's hugely important to make regular backups to prevent you from losing your data such as photos, music, calendars, text messages, notes, and more. 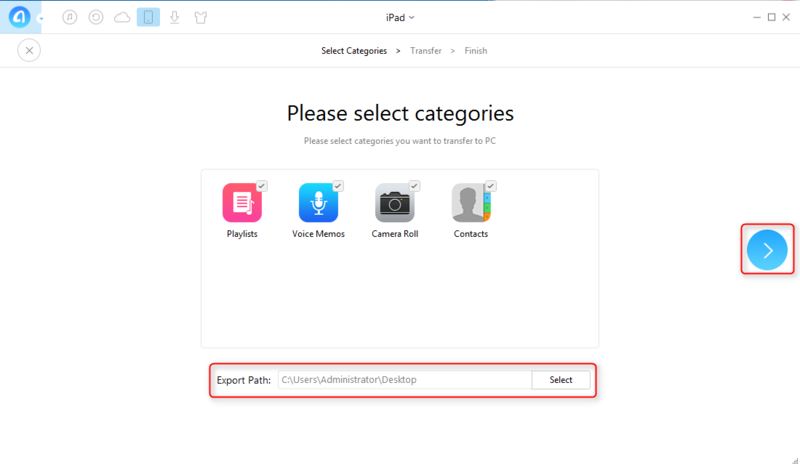 Here, I show you how to backup an iPad in three ways - with iTunes, iCloud and iMobie's AnyTrans. Launch iTunes > Connect your iPad to your computer. In iTunes, click on your device which appears in the left pane under Devices. Click "Summary" at the top of the interface > and click "This computer" in the Backups Section. 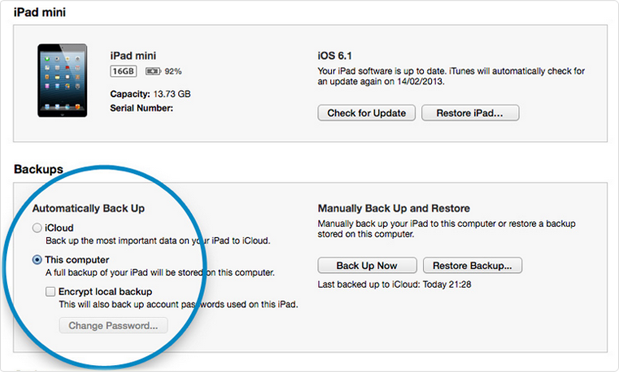 Note: The second way to back up your iPad is using Apple's iCloud. It will back up your iPad whenever you're connected to a Wi-Fi network, so there's no chance you'll forget to back up your iPad, unlike the iTunes backup method. Turn the iCloud Backup switch to the on position. Your device will now automatically backup to iCloud. Note: You only get 5GB of free storage in iCloud, so you need to pay to get additional storage. And you need to make sure that your iPad is connected to Wi-Fi network. There is a third option to backup iPad - with AnyTrans. Download and install AnyTrans on your computer, and following the steps to backup your data from iPad to computer. Step 1. Launch AnyTrans on your computer and connect your iPad to your computer with an USB cable. Step 2. Click Device icon, tap One-Click Content Management and Content to PC. Step 3. Choose data you want to transfer, choose an export path and then click ">" to start backup. 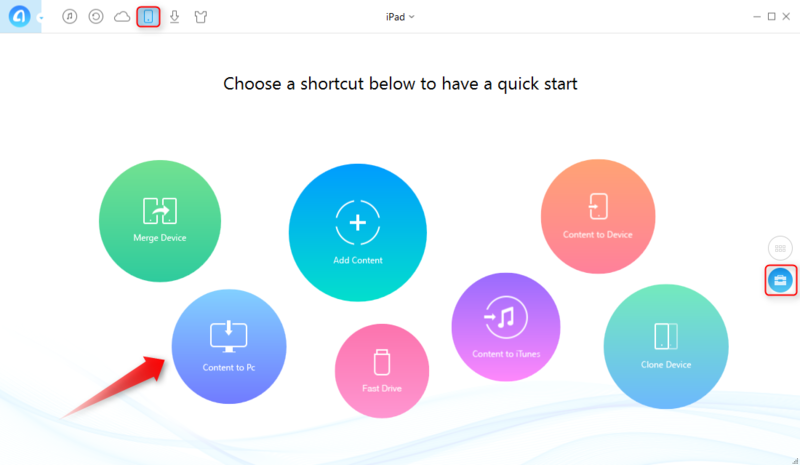 With AnyTrans, you can backup iPad to PC without iTunes. You can also backup iPad contents to Mac and vice versa. Any problem about this article or AnyTrans is warmly welcomed, please be free to contact us by sending an Email or leaving a comment in comment section.